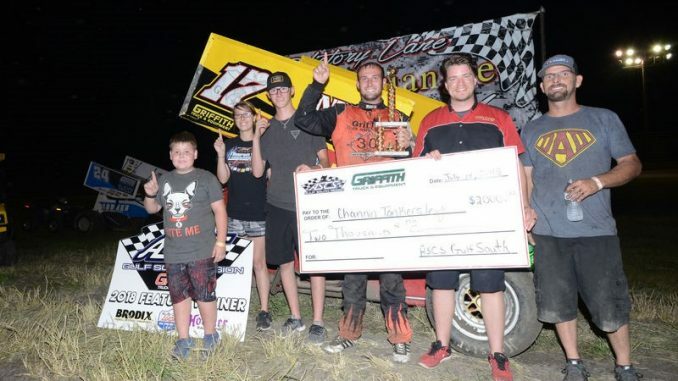 BEAUMONT, Texas (July 14, 2018) – Rescheduled after losing the event to weather one week ago, the Griffith Truck and Equipment ASCS Gulf South Region made its way back to Golden Triangle Raceway Park with Channin Tankersley taking the win. Channin’s 21st career victory with the Griffith Truck and Equipment ASCS Gulf South Region, the podium included Dustin Gates and Jacob Harris. Fourth went to Caleb Martin with Koty Adams in fifth. Josh McCord from 14th ran to sixth with Cody Stacy, Bruce Crockett, Brandie Jass, and Scott Smith to complete the night’s top-ten. The Griffith Truck and Equipment ASCS Gulf South Region races next at Battleground Speedway in Highlands, Texas on Saturday, July 21.